The family problems of a Norse prince? How novel. Ever since Marvel started putting together the pieces of their multi-film Avengers project, Thor has always stuck out as one of the trickiest propositions. Whilst the character has about the same level of name recognition as Iron Man - or at least of Iron Man before his inaugural film came out - the idea of a huge action spectacular built around a Norse god seems pretty far removed from The Hulk and Iron Man, which are obviously ridiculous but are based in a world which is only somewhat heightened. For fear of getting death threats from nerds everywhere, it's the fine line that separates science fiction and fantasy, and it's tough to reconcile the two. Even with the explanation given in the film, that Thor (Chris Hemsworth) is not a god but an interdimensional being whose powers, along with those of fellow Asgardians like his father Odin (Anthony Hopkins) and brother Loki (Tom Hiddleston) made them appear god-like to early humans, there was always the possibility that the film could wind up being too ridiculous to be taken seriously. The decision to hire Kenneth Branagh to direct, then to stack the film's cast with serious actors, also suggested that Marvel were planning to take a very silly idea and treat it incredibily seriously, which is a recipe for the sort of unintentional hilarity that can kill a franchise stone dead. It's to the credit of Branagh and the writers of Thor that they clearly understand the potential for how ridiculous the character and setting could be, and in doing they seek to undercut it as often as possible whilst also treating it with a degree of seriousness that keeps them from abandoning it to pure camp. The majority of the events in Thor take place in two locations; Asgard, the home of Thor and his fellow celestial beings and a place where they have invented instantaneous intergalactic travel yet everyone travels around on horses, and New Mexico, where he finds himself banished after he defies his father's wishes and initiates a war with the natural enemies of Asgard, the Frost Giants. This divides the film neatly into two distinct halves. The Asgard half of the film is, despite the blindingly bright location and the high-end Halloween costumes that everyone struts around in, fairly sombre, and deals with the dysfunction and internal politics of Thor's family. Specifically, it deals with the paternal disappointment that leads to his banishment, and the Machiavellian schemings of Loki, who it becomes increasingly obvious plans to benefit from Thor's absence by taking over. This is where the majority of the eye-candy is contained, as Branagh displays the same skill for using CGI that he did in Hamlet, and takes us through the gleaming halls of Asgard, which have a real sense of weight and history behind them. As if to counter the expected snarky comments of audience members who find the Asgard stuff patently silly, everything that takes place in New Mexico deflates the errant pomposity of Thor, in doing so making the film one of the more purely entertaining releases this year. 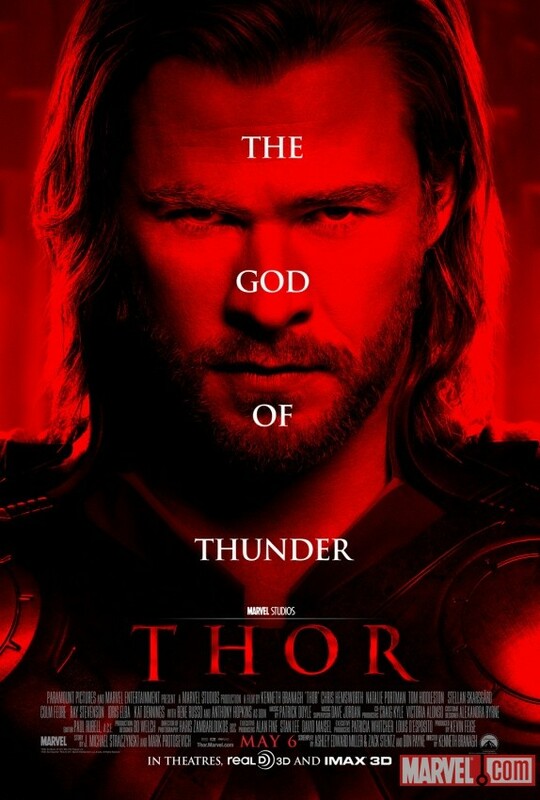 Having been left without his powers or his mystical hammer, Mjolnir, Thor is promptly run over by the scientist Jane Foster (Natalie Portman) who, along with her colleagues (Stellan Skarsgard and Kat Dennings) take him in, hoping that he will be able to offer insights on the strange phenomena that brought him to Earth. Even stripped of the spangly armour that made him look like the figurehead of a gay pride parade float, Thor still acts as if he were in a viking hall, and his inability to get to grips with the way that our world works provide the film with some of its most hilarious moments. Watching him drink a cup of coffee, then smash the mug on the floor whilst demanding more, or storming into a pet store and demanding a horse, then upon discovering they have no horses asking for a cat or dog large enough to ride, make it okay to laugh at Thor whilst still maintaining a basic credibility for the character. More importantly, the ways in which the people around him react to his actions - particularly Dennings, who gets huge laughs with a very deadpan delivery - creates an atmosphere of fun that makes all the stuff about Frost Giants, destructive robots and magic hammers much more accessible and easier to digest. Chris Hemsworth emerges as not just the star of the film, but as a fully formed movie star full stop. He can do action, he can do comedy and he can even handle drama, or at least the lightweight drama required of a superhero movie. Even though he's built like a freight train and has the scraggly blonde hair of a young Courtney Love, he brings a vulnerability to the role that is crucial to making the film work as anything other than empty spectacle. The central thread to the story is one of an extraordinary being learning to become a man, as opposed to most superhero movies which follow the opposite arc. After being banished for his arrogance and hotheadedness, he must learn humility and selflessness in order to regain what he has lost. It's essentially Beauty and the Beast, but a version in which "The Beast" looks like the world's sexiest lumber mill worker. Smartly, the film hides the fact that he needs to become a better person to regain his powers from Thor himself, which makes his development over the course of the film feel more natural than if he were just trying to act nicer to achieve a goal. With the exception of the breathless, action-packed opening, which includes a Lord of the Rings-aping prologue depicting Asgard's war with the Frost Giants and Thor's heavy-handed (and heavy-hammered) actions that lead to his exile, the film actively withholds a lot of the expected action from the audience, instead focusing on Thor's time on Earth, his blossoming humanity and his growing friendship with Jane (ably played by Portman, who doesn't bring a huge amount to the film but doesn't really need to given the nature of the material). The time spent working on that aspect of the story creates heart amongst the talk of gods, science and political scheming, and even gives the final moments of the film an emotional punch that I honestly never would have expected from a Thor movie. Despite succumbing to the usual temptation of all summer blockbusters to turn their final acts into long strings of incoherent violence, Thor is pretty great. It earns its slip into formula with a preceding two-thirds of smartly self-aware comedy, a great ensemble cast and characters who are sympathetic, be they gods or men, good or evil. If the rest of the films released this summer have half the heart, wit and excitement of Thor, then it'll be one hell of a year.